In addition to pavement striping, A+ Worley Striping Inc. offers sign installation and power washing in North East Texas and surrounding areas. Contact us to tell us about your needs and to request a free estimate, today. A+ Worley Striping Inc. installs signs to help direct traffic and wheel stops, also known as parking bumpers, to bring cars to a stop. Both signs and wheel stops are brought to your location where we core drill the signs and hammer drill the wheel stops into your concrete or asphalt to keep them secure. 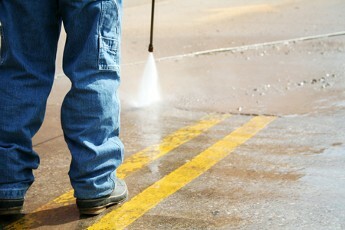 When your parking lot is looking a little run down, call us for power washing and sandblasting. We power wash paved surfaces, including sidewalks and parking lots, to clean away dirt and debris or sandblast them to remove existing lines, giving you room for a new layout. Call or email us to obtain more information about our sign installation, power washing, or sandblasting services.